If you didn't grow up during the 70's, it's hard to relate just how cool it was the first time I saw a digital watch. Not the kind we have now and are so commonplace they're given away in cereal boxes and gumball machines, but the red LED ones that cost a fortune and drained batteries so fast you had to press a button to turn on the display. They were undeniably the coolest thing in town. There was just something magical about those glowing red digits. After a little while, the price came down, and I got a black plastic Texas Instruments red LED watch of my own. It eventually fell apart (hey... I was a kid and the whole G-Shock concept hadn't come along yet), although I still wish I had it... just for the sheer geekiness of it. I still remember the big technological advancement that happened when someone invented a watch where you could tilt your wrist to turn on the display, so you didn't have to press a button to tell the time. But in 1976, the whole LED phenomenon jumped to a whole new level - electronic games. I don't recall exactly where I first saw Mattel Electronics' Auto Race, but it was likely at school (junior high school, to be exact). I'm sure somebody there had one. I remember going over to someone's house and playing it, and probably at school as well, although when Mattel Electronics' Football came out, that became the "must-have" game, completely eclipsing Auto Race. I probably also played it at Sears, or some other store that carried all of those shiny new-fangled handheld electronic games. But wherever I played it, I do remember that I wanted one. But I never got one. Probably too expensive. All of my money went into Cracked magazines and Pop-Rocks at the 7-11. 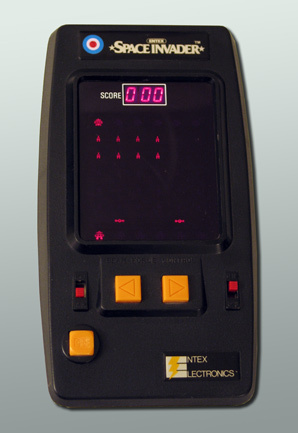 Eventually, a few years later, I did get a couple of handheld LED games, as Christmas or birthday presents. 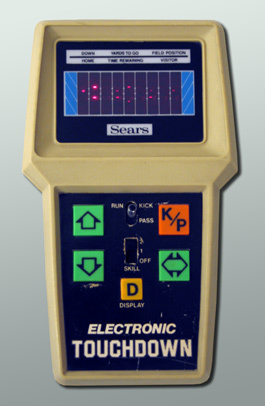 A Sears Electronic Touchdown (a re-branded Coleco Electronic Quarterback), and an Entex Space Invader. (I'm not sure how I ended up getting the football game, since I don't recall asking for it. My guess is my parents asked someone at Sears about which game to get, and that's what was recommended. Good call. It's an excellent game.) I put in a lot of hours playing them, too. You can tell when a handheld is well-used, because the instruction stickers on the back are worn out. I distinctly remember sitting and listening to Dr. Demento on headphones for hours while playing Space Invader. Good times. Also, both games made an appearance in the movie Tron. There's a scene where Kevin Flynn (Jeff Bridges) is in his office at the arcade, and picks up a handheld game and plays it briefly. The game he picked up was a Coleco Electronic Quarterback, but the sounds were from an Entex Space Invader! Cool, huh? By the time I could afford to buy Auto Race, it was probably already gone from the store shelves. Either that, or so many other games had eclipsed it in terms of complexity and quality (VFD games like Cosmic Combat - which I also coveted, or Coleco's Pac-Man, or LCD games like Nintendo's Game & Watch series or Nelsonic's literal game & watch), that it just didn't seem like a good game to spend my money on anymore. Well that, and I also bought an Atari 2600 in 1981, so most of my spending money went into buying games for that. At least, whatever didn't go into the arcades. 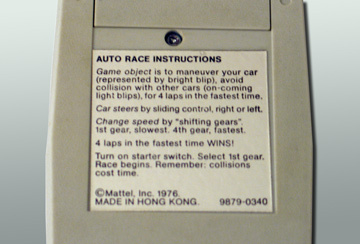 But I never forgot about Auto Race, and from time to time, wondered about buying one. In recent years, I tentatively planned to pick one up at a game expo. However, I still haven't managed to attend one. Probably should someday. Whenever I checked eBay, they seemed few and far-between, or were only available as overpriced CIB versions (and I really couldn't care less about having a box). That changed recently, when several of them all showed up on eBay at the same time. One was CIB (which I bid on because it was cheap at the time, but lost because it wasn't cheap enough), and three others which were loose. Two were near-mint, and the last one was... well, the owner had apparently played it a lot. I bid on the first of the nice ones, figuring that since the CIB one had just sold for $36, I should be able to pick up one of the loose ones for considerably less. If I lost out on the first one, I'd have a good chance on the second. But I didn't need the second chance, since I snagged the first one for $15, which for me, was a bargain (I figured anything under $20 was more than fair, after waiting 35 years ). And within a couple of days, behold! The glowing, flickery, goodness of Auto Race was mine at last! The game works perfectly, too. Switches are solid, everything is pretty clean, the stickers are all intact. In fact, it makes me wonder how much this got played back-in-the-day. The instructions sticker is perfectly intact. No wear. Hardly even a scratch. On my football game, the sticker is trashed. 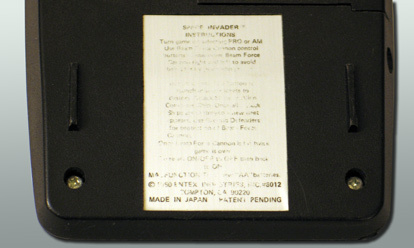 The Space Invader one is completely unreadable. As for Auto Race's gameplay, all I remembered was that you moved a blip (your car) left and right, and avoided other blips (cars). Presumably, the more cars you passed, the higher score you got. As you can (probably) read in the photo above, the goal is to complete four laps in the fastest time. You have to start out in first gear, and as you shift up, you go faster. Or rather, the opponent cars come at you faster. So then... how do you complete a lap? Here's the part I completely forgot about - your car moves up towards the top of the display. If you hit a car, you crash and are sent backwards, losing precious time. I don't know if any arcade games (electro-mechanical or video) at that time (1976) did this, but others (most notably Turbo) would adopt the same risk vs. reward play mechanic later on. You have 99 seconds to complete the game, so that's the worst score you can get. The sounds are grating, and there's no volume control for it (or an earphone jack - which is probably a merciful thing). There is a jack for an AC adapter though, so you don't have to eat through an endless supply of 9 volt batteries. I have no idea how long one will last in it. Anyway, after waiting to own Auto Race for so long, was it worth it? Well, for fifteen bucks - yes. It's a fun little game (smaller than I recall), and a nice occasional diversion. It's not something I'd obsess over - endlessly trying to shave another few seconds off my best time, and certainly the reality of the what the game is couldn't live up to the feelings of nostalgia that the memories of having wanted it conjured up, but it's still fun to have, and the shelf that it sits on - next to Electronic Touchdown and Space Invader - seems somehow more complete now. Next time... we skip ahead a few years. Ah yes. The 70's handheld games. 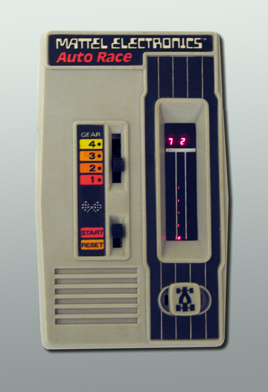 I had the Mattel Missile Attack game that was eventually rebranded to be a Battlestar Galactica game. The twi games played identically but the Battlestar version had cooler case art. And well...it was Battlestar Galactica! 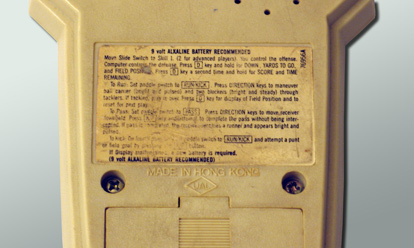 I remember it had a sound on/off switch so I was able to sneak it into class and play it. One day the shop teacher caught me with it and confiscated it. It was quiz day and we were all filling out our paperwork quietly when the teacher got curious about the gadget and turned it on. Not realizing about the stealth mode, he turned it on and was greeted by the loud and bleeping intro "music". Busted! He quickly turned it back off and looked over to the class. All heads were up and staring at him. I did get a Microvision for my birthday in 1980. Hmm... I think I had the Mattel Football (I seem to remember at the time there were two common LED football games and I had the cheaper one). One Christmas I also got Defender which did a decent job of reproducing the arcade game. And later I got (bought?) Q-Bert, another arcade game. Great stuff in the days. There's a veritable treasure trove of PDF manuals at the Handheld Game Museum. Strange I never kept the manuals for mine... I kept all of my Atari stuff. I adore these old handhelds. I really should start a collection. Auto Race sounds like my kind of game (I love timed games). I had Mattel's Football II when I was a kid. I played that game constantly until I lost it somewhere. I received the Coleco version years later, and played that until the buttons got flakey. I found Mattel baseball at a thrift when I first started collecting videogames. That's another classic handheld and quite addicting. I played it just about everyday for a month after I found it. I was kind of happy when the battery finally died, so I could put it down.